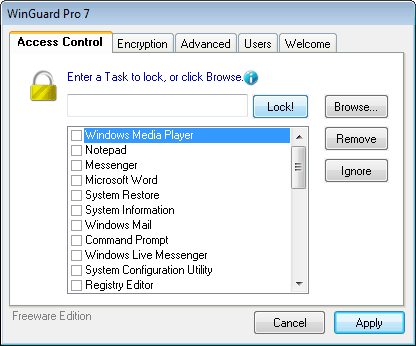 WinGuard Pro is a security software with features such as program access control and data encryption. The free edition has a few limitations, more about that later in the review. The program is password protected, so that only selected users have access to it. Ideal for family computers where the kids should not mess around with the program configuration. The default password is letmein, it is recommended to change the password on first run in the Welcome screen. The program features are divided into five tabs in the main interface of the application. The Access Control tab offers the means to lock tasks or folders in the operating system. A list of standard folders and programs is displayed in a list, including programs like Windows Media Player, the Registry Editor or Command Prompt. Tasks can also be entered in the text field, and by clicking the Browse button that displays a new window with all running user processes. Locked programs are protected with the same password used to log into the software. WinGuard Pro seems to use the names to detect of a program is locked, this has implications for all programs that use the name. Locking notepad for instance will also lock notepad++ on the system. Files, folders or drives can be encrypted in the encryption tab. The encryption strength and algorithm is not listed in the application or the developer homepage. That's highly problematic as it makes it impossible to evaluate the strength of the encryption. The password used to encrypt the data is set in the Encryption tab. It is possible to add a Windows Explorer right-click entry to access the encrypt functionality in the file manager as well. The application offers several additional features under advanced and welcome. It is here for instance possible to lock specific Windows programs like the task manager or Windows Explorer. Some features of the commercial version of WinGuard Pro are enabled by default. It seems as if those are disabled after the trial period has ended, leaving the user with the features of the free edition. The ability to password protect applications could be interesting to some users, especially those who work in multi-user environments. WinGuard Free is available at the developer's website. It is compatible with 32-bit and 64-bit editions of Microsoft Windows.